I wrote a detailed post back in May about the Airrosti (Applied Integration for the Rapid Recovery of Soft Tissue Injuries) method for treating soft tissue injuries and their use of kinesiology tape. At the time I noted that my Airrosti provider had a supply of three of the four major brands of kinesiology tape. 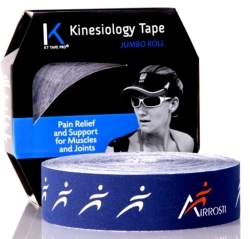 I’m now pleased to announce that they have added the highly-respected KT Tape (Kinesiology Therapeutic Tape) to their arsenal – in fact, they recently contracted with KT Tape to produce a private-label tape with the Airrosti logo on it. Since I’m currently undergoing Airrosti treatment again (this time for a high hamstring strain), I thought this would be a good time to revisit the topic of fascial manipulation and why kinesiology taping is such a complementary modality. Airrosti is a form of “manual therapy” that involves hands-on manipulation of the fascia, the connective tissue that surrounds and connects all body tissues. Fascia can become tightened, twisted or distorted as a result of trauma or overuse, leading to pain and loss of mobility. The only way to correct these fascial issues is through direct manipulation. If that sounds like it might be painful, you’re right. The only way to reach and affect fascia is through deep (and I mean DEEP) manipulation of those tissues. Airrosti therapists do this by pressing deep into the constricted tissue with their thumbs. In my most recent injury, Dr. Schmedding, my Airrosti provider, performed this procedure along the entire length of my hamstrings as well as some of my adductors, beginning at the knee and ending on the ischeal tuberosity (sitting bone). Although it was extremely uncomfortable at times, past experience taught me that this was a“good” kind of pain, associated with the release of tissues to a healthier state. I could actually feel the change in resistance in my tissues as Dr. Schmedding “released” one area after another. And, despite the discomfort I endured during the session, I walked out virtually pain-free, a major improvement over my condition only an hour earlier. I also walked out with several colorful strips of KT Tape extending from my gluteal area all the way down to my calf. (The image shows my earlier IT Band taping.) KT Tape is an ideal companion to Airrosti because of its ability to relieve pain, reduce inflammation and reduce bruising. It also provides structural support without restricting range of motion, an important feature for injured athletes. I’m pleased to say the reduction of pain and inflammation was evident immediately in my painful hamstring. The prevention of bruising was not quite as complete, but what the heck, the KT Tape covered most of it anyway!